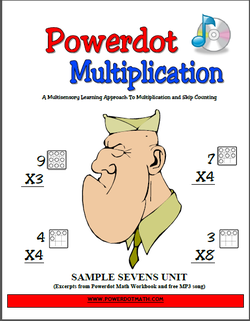 This free download includes the entire "Sevens Unit workbook pages" and Sevens Song audio file taken from the Powerdot Multiplication program used in schools and homes across the county. Combining music, kinesthetic movement, graphics, and a touch of humor, Powerdot Multiplication allows children of various ages, ability levels and learning styles to gain mastery over multiplication in a fun and easy way. Using mnemonic devices, skip counting, and a special, easy to use number system, students using Powerdot Math not only learn and retain how to multiply quickly and easily, but they also gain a deep understanding of what multiplying means.